Stray or abandoned cats in natural environments, and their offspring living in the remotest parts of the island, are a threat to petrels. Although it may be hard to believe, it is quite possible to encounter a cat on top of the Piton des Neiges or at 2000 meters altitude. 10 cats can kill up to 900 petrels in one year! An alarming figure considering that a petrel lays only a single egg per year. Reducing this threat will also help other endemic fauna and flora threatened by these introduced predators. Moreover, recent studies show that stray cats can transmit serious diseases to humans (toxoplasmosis, leptospirosis). Reducing the number of stray cats will improve sanitary conditions. Rats eat eggs and petrel chicks and therefore are considered a serious threat. Rodent control campaigns reduce rat populations around petrel breeding sites. Garbage left in natural environments increases cat and rat populations. These are exotic predators introduced by man. The presence of this waste is an artificial source food that allows cats and rats to breed and multiply in the wild. During takeoff, the reflection of the stars on the sea tells young petrels where to go. These seabirds are highly confused by urban lights. 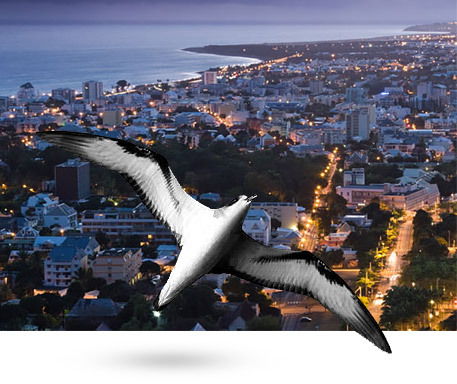 Bright lights in urban areas, sometimes combined with low clouds, produce the same effect as reflections of stars on the sea surface, meaning petrels confuse towns with the open ocean, causing them to crash in towns and cities. To fly, petrels need to launch themselves from the top of a cliff or a tree. Once on the ground, with their large wings, they are unable to take off again and may die of hunger, thirst or be eaten by stray dogs or cats. If you find a petrel, call the SEOR!